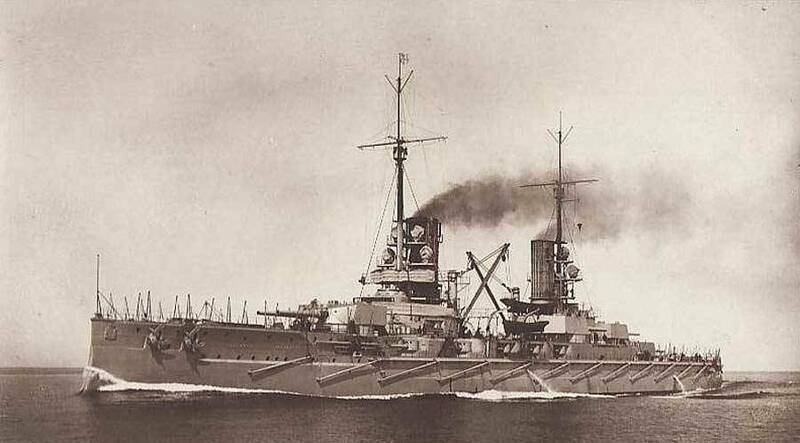 All action times are CETIn the VI Division of the III Squadron, Prinzregent Luitpold (PL) was 7th ship in the battle group line following the 4 König class of the VI Division behind Kaiserin. When Scheer gave the order to fire at 17:47, PL picked out a ship of Lion class ar 22,300 yards but shells fell short. Beatty&apos;s ships increased speed at 17:51 to distance themselves from Scheer&apos;s guns. The new target was Malaya at 19,100 yards but she also had faded into the gloom at 18:38.As others fired on Defnce and Warrior, PL fired on the main British battle line a distance of between 17,500 and 18,800 yards. She fired 21 salvos. Most were over-shoots (see WK b 2580)At the 20:10, turn away, nearly collided with Kaiserin who hauled out to starboard to avoid a collision. PL was now 8th ship, leading the III Division. She was completely undamaged in the battle.